This recipe takes a little longer than some but you can still be eating less than an hour after you start preparation. It is also a good recipe to make ahead, wrap in plastic wrap, refrigerate and serve the next day cold, sliced with your favorite creamy salad dressing. Pound each chicken breast half to a thickness of approximately 1/4-inch. Cut Prosciutto slices in half. Layer a slice of cheese, then a half slice of prosciutto on each pounded out chicken piece. Roll up and secure with wooden toothpicks (or cooking string). Mix the paprika, panko, Parmesan cheese, garlic powder, oregano, and basil together in a shallow dish. Dip chicken rolls in the butter, using tongs. Roll butter dipped chicken in the panko crumb mixture to coat evenly. 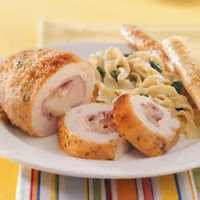 Place the dipped and breaded chicken rolls, seam sides down, in a baking dish that has been lightly sprayed with nonstick cooking spray. Bake at 350 degrees for 25-30 minutes or until the chicken is cooked thoroughly and is golden brown. *Japanese bread crumbs. Substitute regular fine bread crumbs if you do not have panko.